The RSPCA Halifax, Huddersfield & Bradford branch are inviting all two legged and four legged friends to their annual ‘K9 Party In The Park’ on Sunday 9 September 2018, 12:00pm-5:00pm at Manor Heath Park, Halifax HX3 0EB. and lots more to keep the whole family, four-legged or two-legged highly entertained! 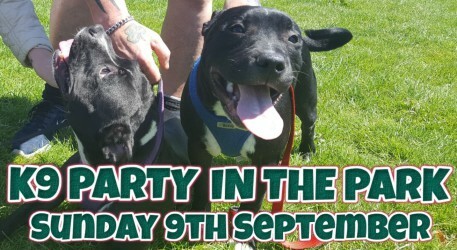 To find out more about K9 Party visit the RSPCA Halifax, Huddersfield, Bradford and Dsitrict branches website here: https://www.rspcahalifaxhuddersfieldbradford.org.uk. You can also find out more on Facebook by searching for ‘K9 Party In The Park 2018’. This entry was posted in Events, Sep and tagged RSPCA Halifax and Huddersfield, RSPCA K9 Party in the Park.